Attached is a picture of our girls. Kona is the oldest, she is one and a half years old. She is a real problem solver, if there is a way, she will find it, and she loves to play and run. to do. She also likes to lay on our front porch and watch passerbys and cars (I'm sure she is protecting us!). Our youngest is Tilly, she is the new addition to the family. Tilly is a German Shepherd mix, we believe she is about 4 months old, and we are so glad we rescued her. little Tilly chase big Kona. Tilly also loves to snuggle with us. Hi,Elizabeth. 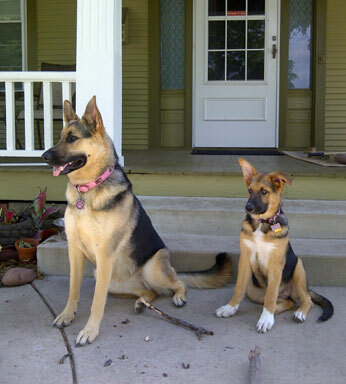 Thanks to you for taking the time to come by here and sharing your gorgeous German Shepherds with us right now. What a great picture - they look very happy and the GSD puppy mix looks so cute and inquisitive. It's always nice to hear about all ourGerman Shepherd family members out there. And I’m sure your two female German Shepherds give you loads of entertainment and love. And I can only imagine how good they are together - especially with the age difference. I imagine Tilly learns a lot from Kona and really looks up to big sis. And readers - thanks so much to all of you for reading along with us and please come back often to see what else is going on in our fast growing German Shepherd Dog community. And we encourage you to let us know what you think about the above story, and many others sent in by readers (found throughout this site) by leaving some comments below.